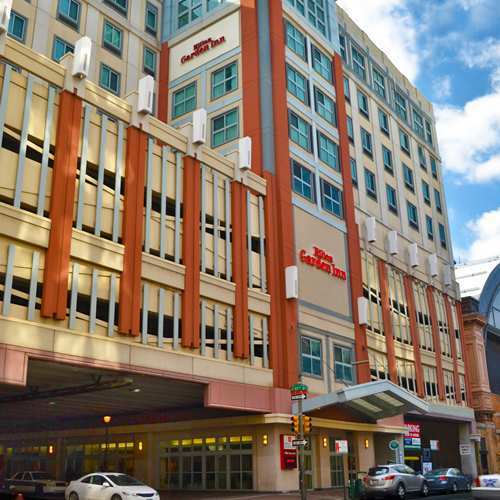 Within walking distance of Chinatown, Reading Terminal Market and the Pennsylvania Convention Center, this hotel offers comfortable rooms with large desks, coffeemakers and all-white bedding. Those looking for additional space in their room should consider booking a junior suite that includes a recessed seating area with a sofa bed. Make time to take advantage of the breakfast area located on the 10th floor that provides sweeping views of the city. Smoke free premises. 279 units. 7-10 stories, interior corridors. Accessibility (Call). At Arch and 11th sts. Adjacent to convention center. 1100 Arch St 19107. Station: Jefferson.